EU Member States’ Development Agencies are important stakeholders in aid delivery and technical cooperation in Development Cooperation Instrument (DCI) countries. The SWITCH to Green Facility will keep the agencies updated on the Flagship Initiative, and work with them in identifying opportunities for collaboration, but also in streamlining the use of inclusive green economy terminology and indicators within the EU. For the EU, socio-economic benefits are at the heart of domestic efforts to advance the green economy transformation. Studies on the circular economy in the EU have provided evidence that “a circular economy, enabled by the technology revolution, would allow Europe to grow resource productivity by up to 3 percent annually. This would generate a primary resource benefit of as much as €0.6 trillion per year by 2030 to Europe’s economies. In addition, it would generate €1.2 trillion in non-resource and externality benefits, bringing the annual total benefits to around €1.8 trillion versus today. This would translate into a GDP increase of as much as 7 percentage points relative to the current development scenario”. 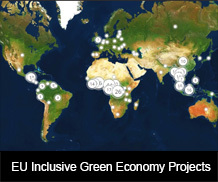 Job creation is one of the main outcomes of measures in favour of the green economy. The number of “green jobs” in the EU has increased from 3 to 4.2 million between 2002 and 2011, and by 20% during the recession years (2007-2011), mainly as a result of an increase in energy production from renewable sources and products for energy -including heat- savings. It is estimated that by 2020, up to 20 million jobs in green economy sectors could be created in the EU. The EU also has relevant experience to build upon in order to support partner countries’ actions to green their economies. Among others, international cooperation in the field of sustainable consumption and production (SCP) or natural resources management, which the EU has been supporting for many years, as well as guidelines on the integration of environment and climate change in EU’s development cooperation, are highly relevant to advancing the transformation towards a green economy. In addition, the EU’s domestic experience –including initiatives such as the Resource-efficient Europe roadmap, the Green action plan for SMEs or the Circular economy action plan – offers lessons to build upon, opportunities for transfer of EU know-how, as well as potential synergies with international cooperation actions to generate mutual benefits. They also demonstrate EU’s determination to shift towards a resource-efficient, low-carbon economy in order to achieve sustainable growth.